You know that can of garbanzo beans that has been sitting in you kitchen cabinet for a while now and you don’t know what to do with it? We’ll make hummus! It’s really a delicious and healthy spread of garbanzo beans, garlic, lemon juice and good olive oil. – 2 TB Tahini which is a sesame paste. It’s readily available now in any supermarket. Stir well before measuring since the paste separates. -1 TB of the the juice from the garbanzoOnce everything is in the processor just blitz until smooth… And you have homemade hummus! Agustin Romo is a Long Beach native and graduate of Le Cordon Bleu. 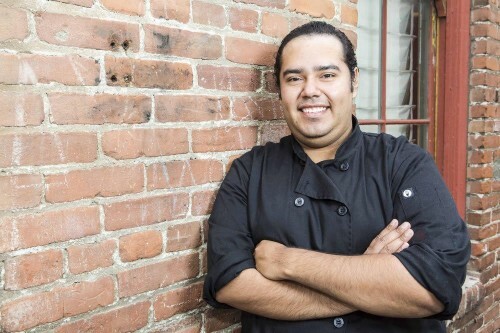 He is currently the executive chef of Eqeko, a mom-and-pop Peruvian restaurant in Santa Ana. He is passionate about food and video production and excited to be helping Long Beach Fresh with “The Little Things” series. Check out his other videos on the Tastemade app here.